Parliament Lawns, Salamanca Place. In the event of wet weather, we will move the event into Parliament House. MC: Leanne Minshull, The Australia Institute. Hosted by Peace Boat, the Australia Institute, the Medical Association for Prevention of War and ICAN. 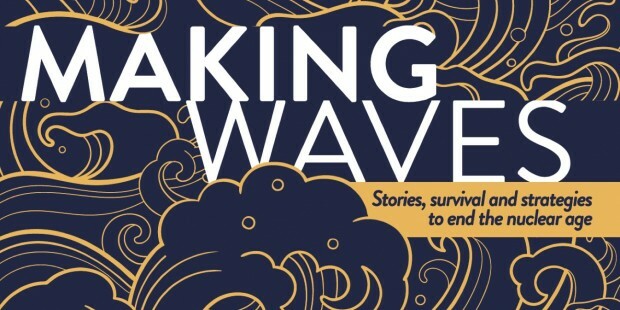 Making Waves is a speaking tour featuring nuclear survivors from Japan and Australia, travelling aboard Peace Boat’s voyage to Australia from 24 January 6 February 2018.
in Western and South Australia, uranium mining and radioactive contamination following the Fukushima reactor melt-down. The Japanese and Australian Governments have not yet signed the new Treaty on the Prohibition of Nuclear Weapons, claiming instead to be protected by the nuclear weapons of the United States. In both nations, powerful civil society movements are demanding their leaders reject these weapons of mass destruction and abide by the new international legal norm. Public events, meetings and media opportunities will take place in five cities. The Tour is a collaboration between Peace Boat and the International Campaign to Abolish Nuclear Weapons, in connection with local organisations in each city.